Gavia immer (emmer, immer, emmer guiss, Beeshop, allan hawk, holland hawk, luim, ring-neckit luim) is a lairge member o the Gaviidae faimily o birds. ↑ BirdLife International (2016). "Gavia immer". The IUCN Red List of Threatened Species. IUCN. 2016: e.T22697842A89564946. doi:10.2305/IUCN.UK.2016-3.RLTS.T22697842A89564946.en. Retrieved 10 November 2017. ↑ Carboneras, C; Christie, D A; Garcia, E F J (2016). del Hoyo, Josep; Elliott, Andrew; Sargatal, Jordi; Christie, David A; de Juana, Eduardo, eds. 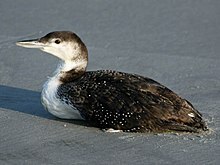 "Common Loon (Gavia immer)". Handbook of the Birds of the World Alive. Lynx Edicions. Retrieved 2016-11-07. (Subscription required (help)). This page wis last eeditit on 8 Dizember 2018, at 07:23.